The Forest Friends Blanket is a very cute, fun project. The blanket is larger than a traditional baby blanket. this allows for the baby to grow into it and use the blanket into childhood or even when they are older. It is even a nice size for me (mom) to wrap up in. The completed size of the blanket is roughly 38” wide X 54” long. Supplies will include about 1,350 yards of the main blanket color yarn and of course use up that scrap yarn laying around for the animal faces. The faces are designed to accent the main detail in the upper face of the animals especially the eyes and ears. Add other fun applique pieces to make it fit your decor, the pattern includes a large flower, small flower, leaf and even a tree pattern you can use. 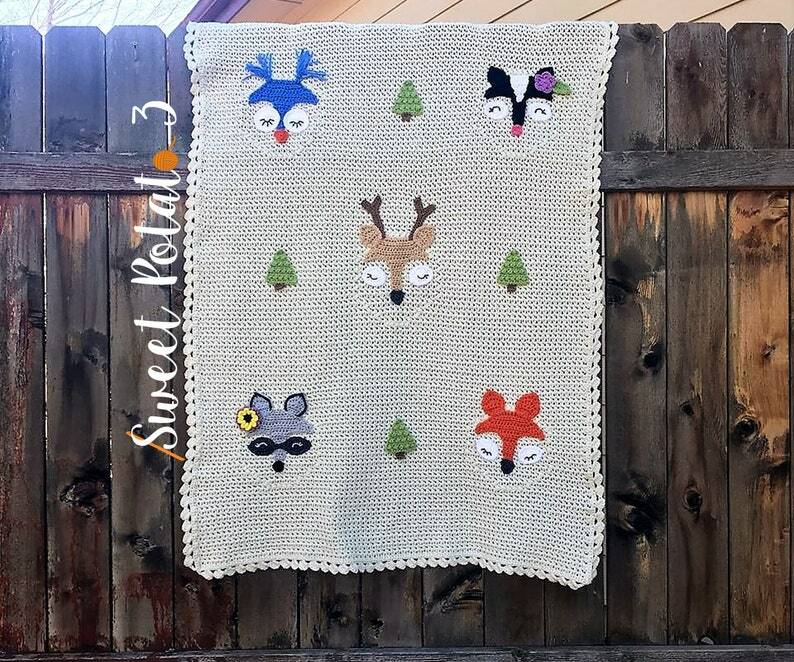 This listing is for just the Forest Friends Blanket ONLY. Made one for an avid GA fan for Christmas and he loved it! Great easy pattern ! Thank you . So happy !! Love this pattern,came out as the perfect bulldog hat!! Love it thank you! Cutest thing and pattern is so easy to read. Many thanks.